Watch this blog on Youtube or on facebook (21min) – it contains extra info and tips! It’s one thing to confirm someone’s life purpose and forecast (find your lifepathand personal year). It’s another to comfort a Soul who’s gone through a breakup, is worried they’re infertile, and/ or has lost a baby. As I wrote in my article about karmic debt, psychic ability is not always linked to spiritual maturity. All therapists need to work on themselves, sometimes twice as hard as other people, to make sure they don’t project their issues onto their clients. I read for hundreds of people a year, many of them parents or parents-in-waiting. So this blog is based on actual stories and experiences. Read more on the St Andrew’s Cross and Medical Stigmata in palmistry – two signs of a healer. “The cave you fear to enter holds the treasure you seek.” Joseph Campbell. I’m a mother of one son (Forrest, 17 months), who fell pregnant to my Soulmate and husband Kris Anderson (also a Tarot reader) after recovering from anorexia/ orthorexia and despite other challenges (including ovarian cysts and painful periods). During labour, I received many 11:11 signs and successfully had a natural waterbirth at the RBWH Birth Centre, inspired by positive visualisations and chocolate cake! After reluctantly weaning Forrest at nine months (due to illness and work commitments), I fell pregnant with Charlie (due September 2017) within a week. This was earlier than planned, but also very welcome as Kris and I just love being parents. Interestingly, I had just completed a Quantum Healing Retreat with Hong Curley and writing retreat with Heather Plett just before then. So I was extremely fired up and passionate about life at the time. I’m now 34 weeks pregnant – see the photo above. 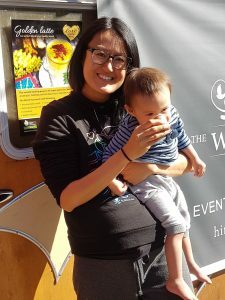 It taken last week – Forrest and I love our turmeric-coconut milk lattes from the Wellness Wagon. Q: When Will I Have a Baby? Or, for those with kids – When Will I Have My Next Baby? A: My answer is – it depends on many factors, including your free will, environment and Soul needs. Over the years, I’ve heard stories of psychics telling people they’ll never have children, or their kids will die before them – which happened to me (see my post on crazy psychic advice). Although I believe there are no coincidences, and that we are told what we need to hear to evolve, I also avoid scaring people just to appear all-knowing. As someone who studied Agriculture and Environmental Science before turning to palmistry and numbers, here’s what I believe: look after the garden and the trees will fruit when they’re ready. If you’re healthy, you increase your odds of falling pregnant. If your partner is healthy, even better. That’s why I wrote my post on holistic fertility, and ‘filling yourself up’. Build your chi (life force/ vibration), build your choices. The Universe loves you. It’s more likely to send in a baby if you’ve got energy to spare, just like the bank is more likely to approve your mortage application if you’ve saved a deposit. If you were a CEO, would you promote someone who’s sick or who’s full of beans? Of course you’d choose the latter. How do you raise your vibration? By taking the path of self-love, i.e. least resistance. If you eat food grown out of season that’s full of chemicals, guzzle coffee and sugar to stay awake (coffee only works if you’re sleep deprived), stay in a job you dislike (and overspend money to distract yourself from the pain), no wonder you don’t have energy left to be creative! Your hormones, thyroid and body clock are likely to be out of whack, because everything going in screams of ‘scarcity’. Start small – take up a hobby, meditate, yoga, turn off your phone, have an early night, try a natural diet, start cooking and saving money, invest in an energy healing* or a past life regression…you’ll be surprised how quickly things can turn around. Healing is always possible. *Deniz Akan works with many couples wanting to fall pregnant and also treats me. I believe I fell pregnant again quickly, partly because I had an amazing first birth, but also because I have an incredible support network around me. I consciously associate with people who enjoy the juggle of family life, rather than surround myself with workaholics. That said, even if a tree never fruits, that’s no reason to cut it down or judge it. It still has intrinsic value and provides shade etc. Beauty comes in all forms, not just boring stereotypes. Some people come here to have lots of physical babies, others are taking a break this lifetime, to focus on their career/ Soulmate/ spiritual growth/ writing/ music etc. Singers Deva Premal and Miten come to mind, for example. As a side note – many people have babies on or after their lifepath turning point/ peak age in numerology (find your lifepath). But even then, that’s not a guarantee. As a Master 29/11 lifepath, I discovered numerology at age 29, and went through a breakup/ career change soon afterwards. However I didn’t birth Forrest until I was 35 (people with my lifepath tend to bloom in our 30’s). Q: Why Did I Miscarry? A: My answer is – because you miscarried. I’m not trying to be obtuse or confusing, just keep you present. A true psychic’s job isn’t to give you answers, but to help you maintain a high vibration so you can continuously find your own. Yes, you could have miscarried because you, your partner or that your baby wasn’t ready. However, it’s also possible you volunteered to help an advanced Soul to finish its incarnations on Earth! Until you specifically talk to Spirit, the answer may never be clear. See my post on psychic babies – they’re not meant to sleep, they’re here to wake us up.Like you and I, baby spirits are entire beings with many lifetimes’ behind them. Although they may feel discouraged if you miscarry, abort or turn them away*, they have Spirit Guides to counsel them as well. Trust that they will be ok in the long run. *Many people report their children saying things like ‘Mummy, I tried to come in before but you said No, so I waited for you’ – see books like Children’s Past Lives by Carol Bowman. I also believe that that babies can be reallocated to other parents (a bit like airplanes being directed by air traffic control to land on alternative runways). For a mediumship reading, see my friends Vicki Haspels or Caroline Byrd…alternatively you can read books like Spirit Babies by Walter Makichen, and connect in your own way. Remember, we are all one energy – everything you say is heard by your Soul, Spirit Guides and potential babies. That’s why prayer is so powerful. Q: How Can I Avoid Miscarrying Again? A: My answer is – you can’t avoid anything for sure, but you can take steps to boost your odds of success. See my responses to the very first question in this post – I’d also recommend the use of acupuncture, fertility yoga (e.g. yogababy in Brisbane), Australian Bush Flower Essences and other vibrational remedies. It’s also important to connect to your ‘why?’ for having a baby and to the baby’s Spirit (as mentioned in the answer above). Having a child to keep a relationship together puts a lot of pressure on everyone involved – are you coming from a place of abundance, or fear? A wish from the heart comes true much faster than one from the head. A big question I’d ask is – how can you love yourself, no matter what your results in life? After all, it’s an illusion that a baby (partner, job, good health – anything external) can make you permanently happy. Just walk onto the street and you’ll see parents who are just as grumpy as non-parents! “Smooth waters do not make for skilful sailors.’ Everything that happens to us, has the capacity to heal us. The only difference between a peaceful person and a stressed one, is how they choose to think and act. As long as you are on Earth, you will have problems to solve. Choose problems worthy of you (this is something I learned at Landmark – I wrote about their controversial courses here). Whether you’re focused on having a baby, raising a baby or even healing from the loss of a child, please know you are always worthy of joy, and Divine supported. Infertility (including secondary infertility, i.e. difficulty having additional kids), is not your true nature. It’s just something you are experiencing right now, in order to trigger your growth. Take a breath, ask for a sign and feel those goosebumps around you – that’s Spirit saying ‘whatever you do and wherever you go, we will follow you’. You are an eternal being and this is only the beginning of your next chapter! Thank you to Tania, Nicole, and the many other people who have inspired this post. I was particularly moved by Alex Blackie’s blog Mother First (she writes on secondary infertility), and hearing Mia Freedman from Mamamia talk to Mary Coustas (aka Mary Kostakidis), who went through 23 IVF attempts and used donor eggs, to have her daughter Jamie. Happy 1st Birthday Forrest – Here Comes Your Sibling! -Share it with your friends. Knowledge is freedom! Please maintain integrity by sending them a link to this article.-Subscribe to my monthly news/ articles (see homepage). Facebook doesn’t always show you all my posts.-Buy my latest Angel Meditation MP3– it’s great for stress relief and for restoring your wings and confidence when life gets you down. I’ve been testing this process for years with clients and myself, and the results are phenomenal.-Join my facebook pages The Numbers Queen and Lifepath 11. You’re welcome to post questions on the timelines, however I don’t offer free advice, only paid readings.